THE 40th anniversary of the death on active service of Belfast Brigade IRA Volunteer Liam McParland was marked by 300 republicans in west Belfast on Sunday. Liam, a quiet, unassuming man and an ardent gaelgeoir, died in a car crash on 6 November 1969 while on IRA business. The commemoration, organised by the Remember Our Volunteers Committee, took place in New Barnsley Crescent where a plaque in Liam’s memory was unveiled by Liam Shannon, Chairperson of the National Graves Association. A large number of Liam’s family were present at the launch along with West Belfast MP Gerry Adams and local Sinn Féin Councillor Maire Cush. 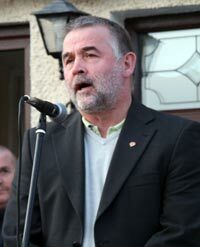 Prominent Ballymurphy republican Jim McGivern chaired the event. Wreaths were laid on behalf of the Republican Movement, Belfast Sinn Féin, Pearse Jordan Sinn Féin Cumann, Remember Our Volunteers Committee, Éire Nua Flute Band and the Ballymurphy ex-POWs. “Our dual purpose in gathering here today is to honour Liam’s memory and to state clearly that the republicans of 2009 are as determined and as committed to the achievement of full freedom as the republicans of 1981 or 1969 or 1916. “Different times and different conditions require different strategies but the goal and the commitment to that goal remain the same. “I believe that today we are closer than ever to the achievement of Irish unity and independence. The tireless work of republicans of this generation has helped to ensure that the final stages of the journey to national freedom can be completed by peaceful means and that no young man or woman should have to risk imprisonment, injury or death in the struggle. “But the journey will not be completed without huge effort and we must ensure that Sinn Féin today is equal to the task and that we mobilise people at home and abroad in support of the great national project of reunification. Jim said that this is a time for strong and progressive leadership and more decision-making powers to be taken from London and placed in the hands of elected representatives here. “The Ireland of 1969, when Volunteer Liam McParland died, was a very different Ireland. “We have progressed greatly in many ways since then. And republicans are determined that there can be no turning back. “We have a New Ireland to build - an Ireland beyond partition where, in the words of Pádraig Pearse, the people will be lord and master. “Sinn Féin is building that New Ireland. We invite others to join with us so that we can make the vision of Pearse and Connolly a reality, so that we can unite our people and our country as Volunteer Liam McParland sought to do. The commemoration finished with Gerry McCabe singing Liam’s favourite song, Skibereen.